WEATHERING AND EROSION ARE BOTH KNOWN AS LEVELING FORCES - WHICH MEANS THEY WEAR DOWN AND REMOVE ROCKS THAT ARE EXPOSED ON EARTH'S SURFACE. WEATHERING IS THE BREAKUP OF ROCKS AT EARTH'S SURFACE DUE TO EXPOSURE TO THE ATMOSPHERE. The presence of just water and oxygen in the atmosphere is enough to break down all rocks given enough time. 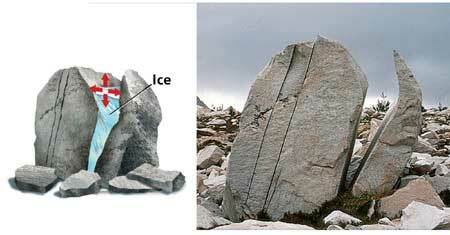 MECHANICAL WEATHERING (AKA PHYSICAL WEATHERING) OCCURS WHEN A ROCK BREAKS APART INTO SMALLER PIECES. Almost all other liquids contract when frozen, but when water freezes it becomes 10% bigger, or takes up 10% more space. As water expands it puts great pressure on the walls of anything containing it, including any rocks which happen to be surrounding it. When water falls into the cracks of rocks and freezes, the force of the pressure exerted on the rock surrounding it is enough to wedge the walls of the crack farther apart, thus expanding and deepening the crack. Ice wedging is what causes pot holes in city streets. Water freezes in the cracks under the pavement. 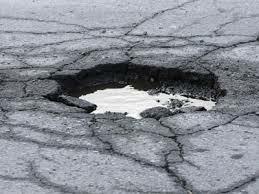 As it expands it forces the pavement up, and when the water thaws the pavement falls back down and creates a pot hole. WHEN CLAY GETS WET IT EXPANDS JUST LIKE ICE DOES. 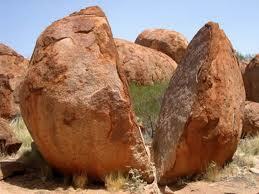 WHEN ROCKS MADE OF CLAY GET WET THE CLAY EXPANDS PUTTING PRESSURE ON THE ROCK, CAUSING IT TO CRACK AND BREAK. Some plants like mosses and lichens are capable of growing without soil on bare rock. When they do this their roots penetrate pores and crevices and cause rocks to split apart as the roots force their way down through the rocks. PLANT ROOTS GROW DOWN INTO ROCK. 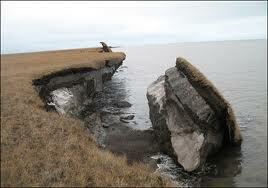 AS THEY GROW THEY WIDEN PUTTING PRESSURE ON SURROUNDING ROCK, CAUSING IT TO CRACK AND BREAK. Animals can indirectly cause mechanical weathering by digging holes in the soil that allows water to reach down to the bedrock and cause weathering there. HYDROLYSIS IS A TYPE OF CHEMICAL WEATHERING THAT RESULTS FROM A REACTION BETWEEN WATER AND ANOTHER SUBSTANCE. Some minerals such as feldspar, amphibole, and augite, react with water to form clay. OXIDATION IS A TYPE OF CHEMICAL WEATHERING RESULTING FROM A REACTION BETWEEN OXYGEN AND ANOTHER SUBSTANCE. Oxidation reactions are the reason that many things rust over time. Minerals and metals that contain iron react with oxygen to form a reddish color of rust. When both oxygen and water are present the iron containing minerals react to form a more brownish rust. ACIDS REACT WITH MANY DIFFERENT MINERALS CAUSING THEM TO DISSOLVE. ROCKS THAT CONTAIN THESE MINERALS CRACK AND BREAK WHEN EXPOSED TO ACIDS. One common way occurs when CO2 is dissolved in water, which creates carbonic acid, the acid in soda. It can also enter the soil as decaying plants dissolve in rainwater. The video to the right shows the reaction between the sedimentary rock Dolostone and a weak acid.